This product was replaced by a updated version Base Shield V1.3 (SLD01099P). Hello, Can you tell me if this shield will work with the Netduino Plus. Thanks. Hi there, if Netduino compatible with Arduino that could work correctly. So you need to confirm that is Natduino same with Arduino? Is there an Eagle layout/schematic file for the Base Shield? I'm trying to check compatibility with FEZ Panda which has got I2C on different pins... Thanks! Now you can go to WIKI and download Eagle file. When will Grove Base Shield be available again? Checked the wiki page but couldn't find the answer. Is this shield compatible with an older Seeeduino v328 dated 6/23/2009 on the board? Yes, it is compatible with Seeeduino and also Arduino boards. could you please tell me if this base shield could or not be used with the Arduino Leonardo ? And with Arduino Uno could I use this grove base shield with I2C & SPI ? 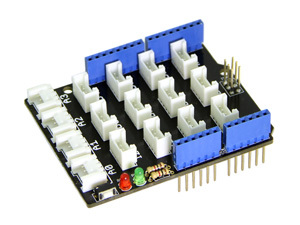 As I want to buy a Seeeduino Ethernet I need first to know if I may connect on it a Relay Shield v2.0 then also put on this Relay Shield v2.0 a Base Shield v1.2. is it possible to use the Gove Base Shield 1.2 with a Seeeduino Ethernet ? And if I use a Relay Shield V2.0 is it possible to put this Base Shield 1.2 on the Relay Shield ? Hi,only two I2C ports on Base Shield.Please look carefully , G/V/A5/A4 is a anolog port. G/V/A4/A5 is a I2C port. Is it compatible with Seeeduino Stalker v2.2 board? I would like use this base shied for 'Grove - 80cm Infrared Proximity Sensor'. If it is compatible can I packed it in 'Seeeduino Stalker v2 enclosure' ? yes,it is.Base shield is compatible with Seeeduino Stalker.And you can use this base shied for 'Grove - 80cm Infrared Proximity Sensor'But in our test,data is different between Seeeduino and Seeeduino Stalker,may they have a little difference. hi,the Base Shield has six analog pins,but there are five analog I/O ports only.So if your sensors are using by single analog pin,you can use it.Or not. Hi there,Grove jack is 4pin. On this grove basic shield also is 4pin. The Base Shield comes back? And if when? This product has shut down and you can choose Base Shield v1.3 if you wanna buy it. Thanks. Please let me know whether the Arduino UNO R3 is compatible with the Grove Base Shield which comes with the Grove Starter Kit Plus. Of course, the base shield is designed for Arduino/Seeeduino. as they just now created a realy new interesting Arduino board named Yun could you please tell me if your Base Shield v1.2 could works (for all GPIO) with this Yun board ?